Crikey! I'm going to get a lobotomy soon. It's the only way to stop saying Crikey! Believe me, it's best. The Australia Zoo bills itself as the #1 tourist attraction in all Australia. That's a tall order, but they deliver value for money. And they are big on cool experiences, even for the Aussies in attendance. There's no missing who owns the joint. Steve's plastered all over the place, holding crocs, cuddling tigers or being hung by snakes. There are all manner of goods available w/Steve, his wife and even his tiny daughter (you remember the one ...) on it. All are holding crocs. All. Crocs rule! The brand is safe. In fact, Steve himself was here! We encountered him early on when he rode up on a motorbike and took a small baby for a high-speed ride around the park in the rain. I am not making this up. Where to begin!? The animals are very accessible. 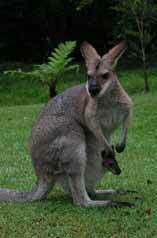 For example, the kangaroos have a habitat that people wander through, feeding them at every turn. They are quite extraordinary creatures. Very expressive and with a body mechanics you can't turn away from. We saw many females with joeys in pouch, and one with a joey peering out, taking in the world. All these females were quite tame and loved to eat food out of people's hands. I saw two females take turn sniffing at each other's buldging pouches. I asked the ranger-person about this and she allowed as how that was unique in her experience. She had seen it too and was amazed. Females generally do not allow any other animal near their pregnant pouches. Just then, as if on cue, the two kangaroos being discussed threw their arms around each other. Perhaps they were having fun at our expense? The Koalas were adorable, of course. Stoned out little yodas with tree branch wedgies. The word Koala comes from the aboriginal and means "no drink". Indeed these little teddy bears never drink. Ever. Their diet gives them sufficient moisture, but little energy, hence the 20+ hours of naptime each day. We managed to see the Tasmanian Devils for about a minute before buckets of rain drove us to cover. They are omnivorous little beasties with poor eyesight and sharp teeth. The introduction of dingoes to the mainland drove them out of business there. Tasmania is their only home now. The dingoes weren't all that exciting. Just dogs really. We also missed out on the wombats, although not out of boredom. There were elephants, emus, camels, birds of prey and venomous snakes too. Our heads were spinning by the end and we had to vacate. I must make special enthusiastic mention of the Cassowary. It is a well-established theorem nowadays that dinosaurs evolved into birds. This was controversial, tho, until not too long ago. 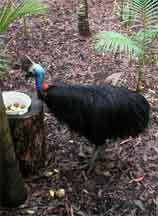 One look at a Cassowary is all it would take to convince anyone of the truth of the proposition. They are feathered dinoraptors. The ones we saw were buddhist. They were constantly walking counter-clockwise around trees. We sat through a show in the Crocoseum. It was a croc show, hosted by the Crocodile Hunter himself! Mostly, though, it was his wife having fun at his expense. It was the usual baiting and dodging of a large crocodile. Ho hum. Steve managed not to be et yet again. A drive through the Glass House Mountains, so named by Capt.Cook himself, started the day off right. I had 2 points of interests in mind: the Australia Zoo, and the Big Barrel Winery. Shaped like a barrel, how could I resist? Armed with cameras and plastic bags, I realized that Dan and I were probobly the only couple sans children to be at the park. No worries! We could move quicker! The Zoo map scared us by its scale, so we used a blue sharpie to mark out each point of interest to ensure we'd get to it in time. Walking past a little tree enclosure I noticed a sign to visit the baby koala exhibit in another area. I scanned and kept walking. Behind me, Dan started to make a fuss: Did you see these? He yells. Yeah, what? THE KOALAS! There were 7 of them snoozing in the same trees I just bypassed! Walking on to book an encounter with the Tassie, or Tasmanian Devil at the information booth, we passed by a baby sitting atop a giant crock. Right. Someone please get that baby...now he's gonna eat that boys head! Dont put your torso in its mouth....oooohhhh, its fake! But huge! There we stood filming a baby crawling along its back and tail when a motorcycled-man rides over, gathers a baby from a granny sitting on the side and rides off asking 'Right, where's the crew then?'. Meaning the camera crew! That was Mr.Irwin himself obviously taking his younger son off on a ride-about! We got to see more of Steve and his wife during the crock show, which turned out to be a lot more fun (and adult oriented in humor) than expected. The map needn't have scared us, as the park was actually a bunch smaller and easier to get around then it appeared. Seeking out the kangaroos, Dan and I entered a fenced in area with a housed observation area. The rain kept us inside it, and we were pleased enough to watch the single kangaroo hanging out under its roof in a fenced off part. As a ranger came to provide feed, I asked how many kangaroos were here in this part. She said 47 with another 20 in another area. I was stunned! Then I looked around and realized, the whole area was completely open for us and the roos to walk around in! No fencing between us and them. The roos would even eat from your hand if you bought the feed. They love their necks rubbed, and have surprisingly soft fur and paws. The Zoo's atmosphere of ineraction and preservation of all the animals here won me over tenfold! Go Steve and Terry, though you tread on obnoxious, you recover through your obvious love for the animals. Kudos! After the Zoo, we drove into the mountain range to find the barrel shaped winery. The sign clearly said Open 7 days! Except Christmas and Anzac Day. Well maybe it was Anzac Day, cause the sucker was locked. A bit disappointed, we drove on admiring the Irish-like hills of undulating greens under a blanket of snowy (but tropical) fog. It was rather magical! Oh yeah, and we got to see the Giant Pineapple too!